Hi this is Elizabeth calling from day four of our Kilimanjaro climb. 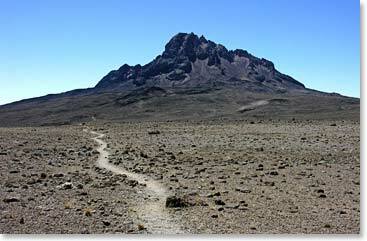 We've just begun hiking towards Mwenzi peak from Kielewa Camp at 3,600m/11,811ft. We had a great night's sleep last night, a delicious breakfast, and now we're about to hike about 3 hours on steep terrain towards the Mwenzi Camp at 4,330m/14,200ft. The weather is great, we're having a lot of fun with our guides John and Simon, and were just excited to be moving up closer and closer to the top! It should be a great day and we'll check back tomorrow.